Kristal (Alleman?) 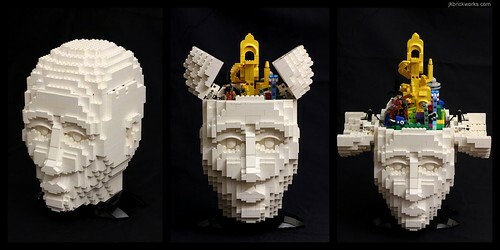 made this cool kinetic sculpture, Inside the Mind of a LEGO Artist. Follow the link to see a video of it in action. Such a great idea put into bricks! The mechanics behind it are executed really well. Thanks for sharing! Wow, that is truly incredible! And just looking at that tells me this person is definitely knowledgable in anatomy, because they have a great understanding, from what I can tell, about the musculature that overlaps the cheekbones, and other parts of the skull.